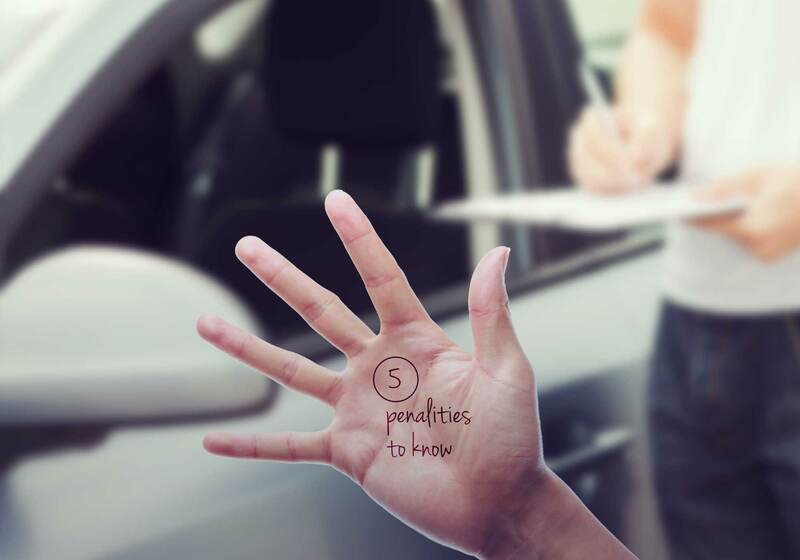 Even the safest drivers could land themselves a fine or penalty if they’re not fully aware of all the driving rules. Stay informed and road safe! It’s obvious that driving safely is crucial to protect yourself, your passengers and other road users. But even the safest drivers could land themselves a fine or penalty if they’re not fully aware of all the rules. We recommend that you have a good understanding all of the UK driving penalties so that you can make sure you don’t put your licence – and your bank balance – at risk. Here are some driving penalties that we think you might find it helpful to fully understand in order to stay safe on the road. You must not stop in a yellow box junction (unless you are turning right and are prevented from advancing by oncoming traffic, or other vehicles turning right). Potential penalty: Fixed Penalty Notice of up to £70 outside London and up to £130 within London. Top tips: Only enter a box junction if you’re sure you will be able to pass through to the other side and look ahead when driving in heavy traffic. You must not drive with uncorrected poor eyesight. In other words, you must be able to read a number plate 20 metres away. The Police can pull you over and request you do this test if they believe your eyesight may not be good enough to drive safely. Potential penalty: £1000, three penalty points or disqualification from driving. Top tip: Always make sure you have regular eye tests to ensure you’re safe to drive. You must wear a seatbelt whenever one is fitted in the seat you are using. The driver is responsible for ensuring appropriate seatbelt use whenever the passenger is under 14. If the passenger is 14 or over, they are responsible for their own seatbelt use. You must ensure that the details on your driving licence are up to date. You must tell the DVLA immediately if your permanent address or name change. Potential penalty: You could be fined up to £1000 if you are pulled over by the police and they find your licence is out of date. Top tip: Check your driving licence regularly to make sure everything is up to date. If you change name or address make sure you tell the DVLA immediately. You must not use a mobile phone held in your hand while driving, or when stopped with the engine on. Top tip: Keep your mobile phone out of sight when driving. Remember even hands free phone use can be a significant distraction when driving, so you may want to pull over somewhere safe first. For more information on driving penalties, please visit the gov.uk site.